Many years ago I decided to teach myself how to play the clarinet. This isn't terribly far-fetched, if you know my history: I first played the trumpet, then the baritone in 5th grade, then had a change of heart (Gemini Problems!) that summer and decided to teach myself to play the flute so I could re-join the band in the fall. I had this weird belief (hope?) that maybe if I played the flute, I'd figure out how to be more feminine. After all, the girls in the flute section were all girls, and Tomboy Amber felt like she never got the memo. I'm not sure why I wanted to be more feminine, other than out of curiosity, but whatever it was, I played the flute in my school band for another three years, until I got to high school and quit band entirely to take up singing in the choir and working on plays. I've always been fascinated by the clarinet. I love how it sounds. I love reeds. I've always wanted to play an instrument that used a reed. 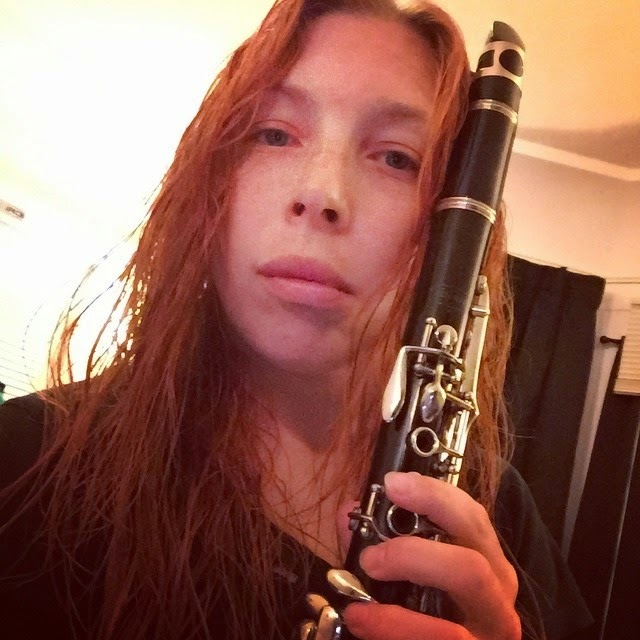 Plus, lets face it: all the weird girls played clarinet. I'm a weird girl. I think I missed my band calling! So I've always wanted to learn how to play. I bought my clarinet at a music store in Berkeley, probably about a decade ago. The store was closing and instruments were being sold at rock bottom prices. This is the only way I could afford a clarinet at the time, so I jumped at the chance. I didn't really get around to learning how to play it, though. You know how it goes. Life gets in the way. Something I've realized over the years is that I have a lot of interests and hobbies, and not nearly enough time to enjoy them all. This fell by the wayside. I first really took the clarinet out last winter. I think it was because Gabe was re-learning how to play a trumpet for his drum corps show in the Chinese New Year Parade, and he had just bought a bass guitar, and I felt musically inspired to strive for more for the first time in a very long time. So I started slow, fitting in lessons here and there, usually late at night, while drinking wine (duh) -- first learning how to put it together, then learning how to make noise (it's not very different from a flute in this way, so I think I had a head start) and then figuring out how not to make horrible squawking noises when trying to play notes. I've watched videos and read articles about proper embouchure, and I've come to realize that most of my problem is when my mouth gets tired! Then, a few weeks ago I actually set out to learn actual notes, re-learn how to read music and play actual songs. It's going better than I'd feared. I do think I have an aptitude for music, and it's really nice to feel like that hasn't gone away, or was limited to my childhood. 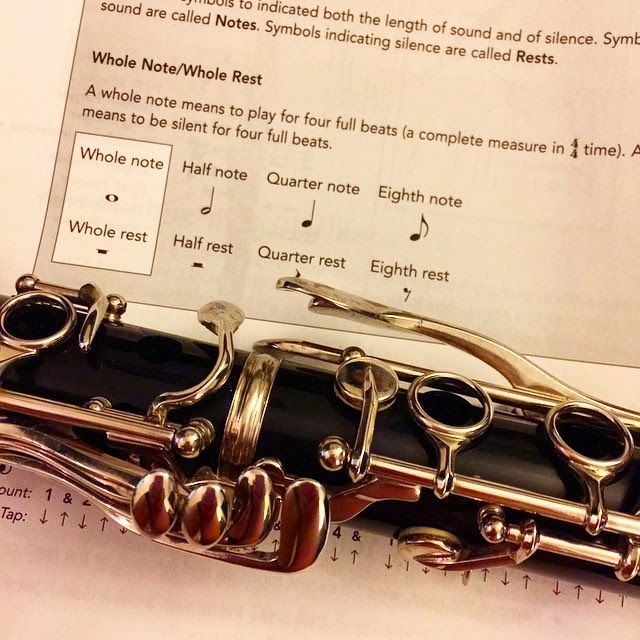 The hardest part is absolutely re-learning how to read music. I last read music when I was part of the UC Berkeley Women's Chorale in 2005-06, but even that wasn't really straight up music reading. So yeah, my skills are rusty, but as with anything, practice should help me find a groove. I'm not expecting to become a concert performer here, but I hope to prove to myself that I can be a decent clarinet player, and play beautiful music. That's all this is about. And it makes me happy.